Hosting a Holiday Party? Make Sure Your AC Can Keep Up! It’s a cool winter night and the perfect time to through a holiday party in West Palm Beach. With temperatures finally at a level that you can open your windows and let in a cool breeze, you don’t have to worry about using your air conditioner, right? Well… not quite. Even if temperatures are cooling, having numerous house guests in your home at once can warm your living space right up and increase the humidity as well. And let’s face it, more humidity is not something we need in Florida! Keep reading for some tips on how to effectively use your air conditioner and keep your home comfortable during even the largest of gatherings. It’s essential that you know your cooling system is in good shape and won’t break down during the strain it will undergo as it runs for hours to keep your house cool during a party, let alone any other time you’re using it. This means making sure you get your annual maintenance check for the system and following that maintenance session up with any recommended repairs that are brought to your attention. Also, with maintenance or not, if your air conditioner is showing any signs of a malfunction or unusual behavior, it’s never a bad idea to give our pros a call! What if temperatures seem low enough that you don’t need to use your AC? Well, unless we’re having a sudden, unseasonably cold week that is sucking up all the moisture in your home, then you’ll want to heed this advice. Higher humidity is a big problem during large gatherings, especially in our area. Each person’s exhalations raise the moisture levels. 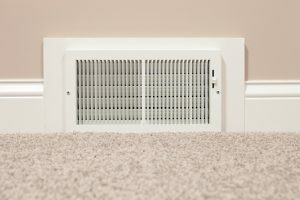 But you can combat the humidity rise by removing as much moisture as possible from the floors, walls, and furnishing in your home by running your AC even if you don’t need it. Now it is important here that we mention a whole-house dehumidifier will really do the trick in ridding your home of excess moisture. Your air conditioner is not designed to do this job, it just helps by removing some of the condensation in your home! If for whatever reason you don’t want to run your AC in the days prior to your holiday party, we at least recommend running for a few hours before your first guest arrives. You may even want to lower the temperature 5° below what’s normally comfortable for your household. Sure, this seems chilly at first, but ultimately you’ll find that each person in your home is more comfortable this way. For reliable West Palm Beach HVAC services and more, contact Envirotech Air Quality Services today!